How Koreatown Rose From The Ashes Of L.A. Riots Twenty years ago during the Los Angeles riots, a disproportionate number of Korean-owned businesses burned to the ground, casualties of terrible black-Korean relations. But after the fires went out, the once-insulated Korean community began reaching out to lessen discrimination — and keep history from repeating itself. Twenty years ago during the Los Angeles riots, a lot of the city's neighborhoods went up in flames, but Koreatown is one community that literally rose from the ashes. 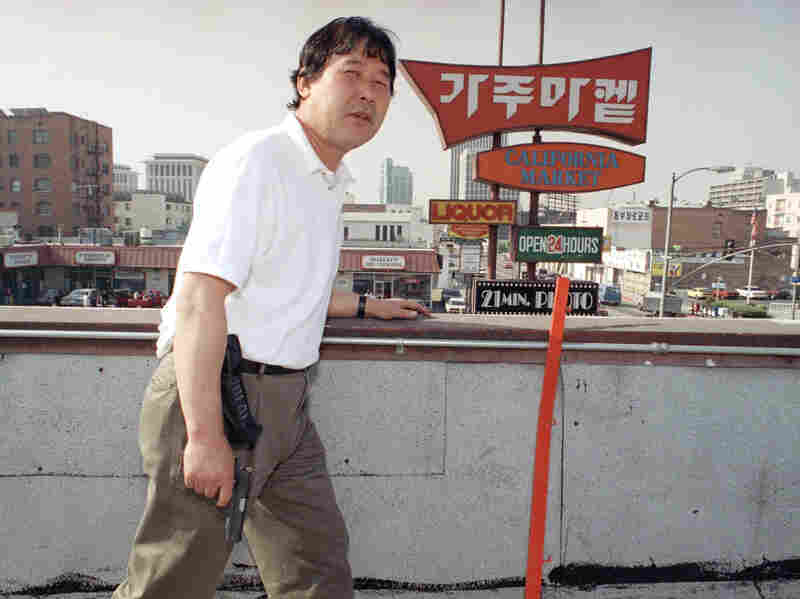 During the six days that the riots raged, hundreds of businesses, many of them owned by Korean immigrants, were torched in the violence that followed the acquittal of the four LAPD officers who beat Rodney King. Whole blocks of Koreatown went up in flames that night. Today, a lot has changed. There's no evidence of the fires, and shopping malls there — plain and fancy — seem to be doing well. Pricey condominiums have been built nearby, and a major Metro station draws people from around the city. According to the U.S. Census Bureau, Los Angeles has the biggest Korean-American population in the country. Edward Chang and his family arrived in L.A. in 1974. Chang, a professor of Asian-American studies at the University of California, Riverside, says they came in pursuit of the American dream — and they weren't alone. Many Korean immigrants arrived with hopes of becoming economically successful so they could secure their children's futures by sending them to the country's top universities. "And many believed that owning and operating small businesses was the easiest and quickest way to realize the American dream," Chang says. But working toward that dream came at a cost. Purchasing a business was expensive, so the new immigrants bought where they could afford property, often in poor, working-class neighborhoods in and near South L.A. According to Chang, the diversity of such neighborhoods often came as a shock to people arriving from what is often considered to be the most racially and culturally homogenous country in the world. "Remember that they came here without any knowledge of a history of racial confrontation or race relations in America," he says. "And many came believing the United States of America was a white country." Chang says a lot of what the early newcomers knew about the U.S. came from subtitled broadcasts of American television, which often depicted an idealized society. Little House on the Prairie, for example, was hugely popular. Koreatown store owner Kee Whan Ha shared his memories of the riots with NPR's Michele Martin. Of course, reality was considerably different. For the newly arrived immigrants, trying to adjust to a new, multicultural reality and a new language was stressful. Then came the events of March 1991. Months later, the 51-year-old storekeeper was convicted of voluntary manslaughter, but after posting a $250,000 bail, she was immediately given probation. 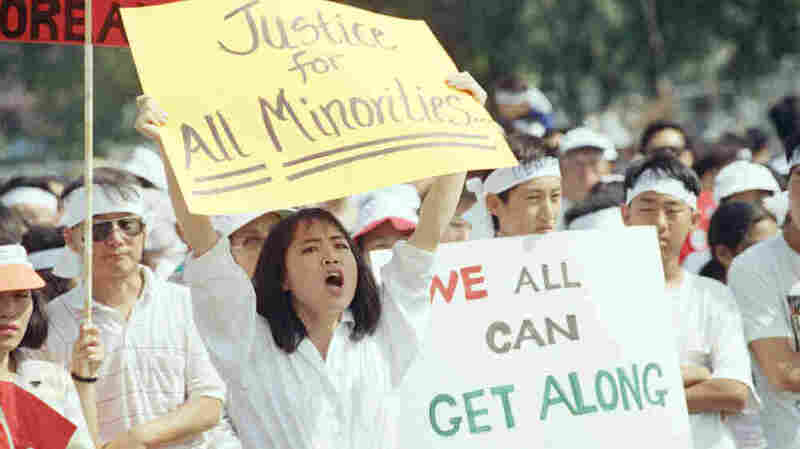 Civil rights attorney Angela Oh is the daughter of Korean immigrants and was a spokesperson for the Korean community during and after the riots. She says Du's probation was the true ignition point for the L.A. riots. "The visual was a woman walking out of court having just completed a case in which a teenager had been shot and killed, right? So the ire was really intense at that moment," Oh says. "My belief is that that was the spark." Richard Rhee stands vigil, armed with a handgun and a cellphone, on the roof of his grocery store in the Koreatown area of Los Angeles on May 2, 1992. A disproportionate number of Korean businesses were looted and gutted by fires in the L.A. riots. Large parts of L.A. were engulfed in flames, and Korean businesses suffered disproportionately, a casualty of terrible black-Korean relations. Many buildings burned to the ground as their owners waited in vain for assistance from authorities, while some businesses were saved by volunteer gunmen who took aim at looters to scare them away. Edward Chang says the riots were a turning point in Korean identity. "Prior to 1992, Korean immigrants considered themselves Korean," he says. "But after 1992, they began to call themselves Korean-Americans." According to Chang, that's an important distinction because it means Koreans began to see themselves as a permanent part of the U.S., rather than temporary residents. Korean-Americans began reaching out, working with other ethnic communities to lessen discrimination and politically empower themselves. Much of Koreatown has physically recovered and expanded greatly beyond its original borders, and scholarship on the Korean-American community has blossomed since the riots. Those changes are in full force at the annual dinner of the Korean-American Bar Association, a diverse gathering of Angelenos in civic and business life. Businessman Chris Lee says one important post-riot lesson for his community was the need for tolerance in a multicultural environment. "I think we are much more accepting, which I think is a first step toward becoming assimilated into this country," Lee says. Korean-American Judge Howard Halm believes Koreans' historic pattern of resilience has allowed his community to recover from the riots' devastation. "This is kind of the persona of Korean-Americans," he says. "It's like the Jews of Europe — they're used to being beaten down and then coming back again." And, in Los Angeles, a large part of that comeback has been the growing embrace of one of the most multicultural and multiracial cities on Earth.